Why did the witch-craze happen in Early Modern Europe? For three centuries between 1450 and 1750, diverse societies were consumed by a panic over alleged witches in their communities. Witch-hunts, especially in Central Europe, resulted in the trial, torture, and execution of tens of thousands of victims. Historians have carried out a huge amount of research into the reasons for this 'craze' and found that predominantly the witch hunts took place against a backdrop of rapid social, economic and religious transformation that inspired feelings of disunity, fear and uncertainty. These three factors interlink continuously within the explanation for the witch-craze, the factor that appears to dominate is that of social transformation lying especially within its intellectual foundations. By the end of the 16th Century, most educated Europeans believed that witches, in addition to practicing harmful magic engaged in a variety of diabolical activities 1. At the outset, the ideas surrounding the witch-craze were mainly the property of the literate and ruling classes and not of the common people, formulation of those ideas had been the work of theologians, philosophers and lawyers, and the men who subscribed to them were judges, clerics, magistrates and landlords 2. ...read more. The major epidemics of syphilis in Europe coincided largely with the witch-craze during the 16th and 17th centuries; Stanislav Anreski claimed that the disease itself was largely responsible for the persecution of witches; he even suggested that syphilis, in its advanced form, could cause the physical characteristics of the witch image 10. This argument is supported by evidence showing that witch hunting coincided geographically as well as chronologically with the syphilis epidemics. The Black Death and the wars of the 15th Century killed more men than women. There were visibly more women than men. Such demographic transformations led to changes within the family structure creating many more unattached women, namely spinsters and widows who were not under the control of fathers of husbands 11. There is reason to believe that this single status contributed at least indirectly to their plight. In a patriarchal society, the existence of women who were subject to neither father nor husband was an increasing source of concern, if not fear and it is not unreasonable to assume that both the neighbours who accused such women and the authorities who prosecuted them were responding to such fears 12. ...read more. Sharpe, J.A. 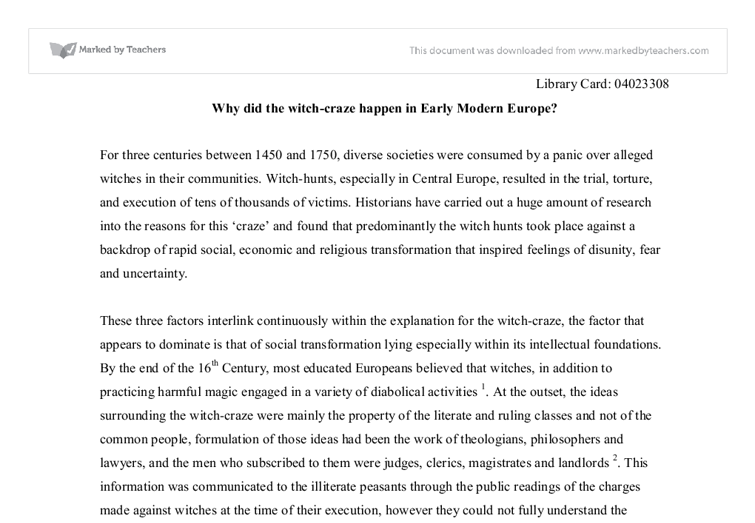 Witchcraft in Early Modern England. 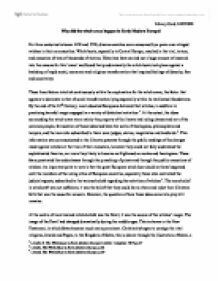 (Harlow: Longman 2001) Waite, G.K. Heresy, Magic and Witchcraft in Early Modern Europe (Basingstoke : Palgrave Macmillan, 2003) ?? ?? ?? ?? Library Card: 04023308 1 Levack, B. The Witch-hunt in Early Modern Europe (London: Longman 1987), p.27 2 Levack, The Witch-Hunt in Early Modern Europe, p.28 3 Levack, The Witch-Hunt in Early Modern Europe, p.29 4 Levack, The Witch-Hunt in Early Modern Europe. p.31 5 Bossy, J. 'Moral Arithmetic: Seven Sins into Ten Commandments', in Conscience and Casuistry in Early Modern Europe. (Cambridge, 1988), pp.229-231 6 Trevor-Roper, H.R. The European Witch Craze of the 16th and 17th Centuries (Harmondsworth: Penguin, 1969), p.11 7 Levack, The Witch-Hunt in Early Modern Europe, p.102 8 Levack, The Witch-Hunt in Early Modern Europe, p.105 9 Levack, The Witch-Hunt in Early Modern Europe, p.107 10 Quaife, G.R. Godly Zeal & Furious Rage (London: Croom & Helm 1987) p.16 11 Quaife, Godly Zeal & Furious Rage, p.15 12 Levack, The Witch-Hunt in Early Modern Europe, p.147 13 Levack, The Witch-Hunt in Early Modern Europe, p.61 14 Monter, E.W. European Witchcraft (New York: Wiley 1969), p.10 15 Ben-Yehuda, N. The European Witch-Craze of the 16th and 17th Centuries in 'Moral Panics' 114-184 (1994), p.11 16 Levack, The Witch-Hunt in Early Modern Europe, p.64 17 Levack, The Witch-Hunt in Early Modern Europe, p.65 ...read more. NATO, meanwhile, has taken several steps such as accepting new members, Partnership for Peace (PfP), which was created in 1994 to increase the cooperation between NATO and countries of central and east Europe, Euro-Atlantic Partnership Council, later becoming NATO-Russia Council (2002), Charter with Ukraine and new relations with the Western European Union (WEU). What evidence is there of the emergence of new forms of racism within Europe? cultures have the right to develop freely, with a right to a homeland and a separate national identity. These are arguments of Cultural Separatism. Advocators of this ideal believe and appreciate the difference in cultures and feel that cultures will only mature and develope separately from each other. military operations.6 From De Gaulle to Chirac, France's consistent pattern is to shrink from any dependency upon the US, and to promote a free and autonomous Europe. On the other hand, France is certainly not always in favor of supranationalism. 0,37 Euro 25,98 Euro Portugal 25,13 Euro 4,55 Euro 29,68 Euro Average 15,51 Euro 1,59 Euro 17,10 Euro For the European Commission, there were a number of important reasons to initiate this regulation. A starting point in their analysis was that the Euro was meant as mean to further integrate European national economies. United Nations: &amp;quot;In Bed With The Devil&amp;quot;. and intervene against the Serbian atrocities being committed against ethnic Albanians in Kosova, and moral action only came from the leadership of the United States and Great Britain when they led NATO to take action against Serbia. A UN resolution only came about "after the fact" that the US and Great Britain held Serbia accountable for their actions.